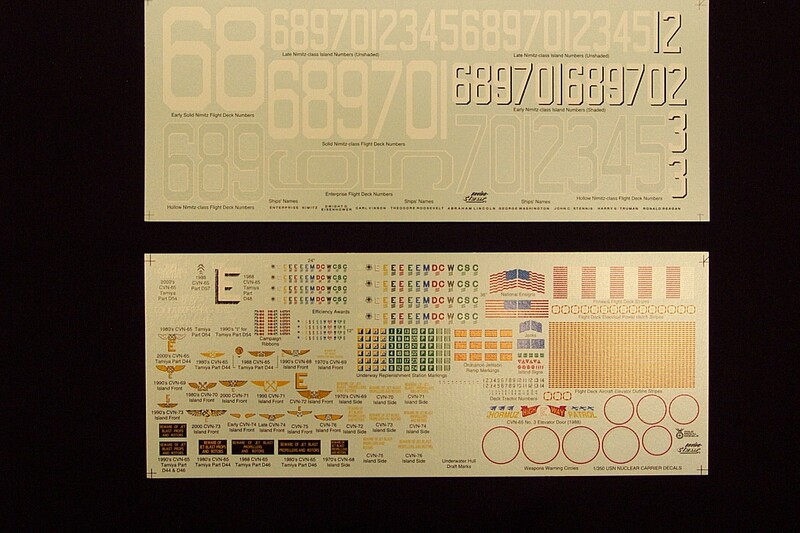 SEE PHOTOS AND A REVIEW OF GMM'S 1/350 USN NUCLEAR CARRIER DECAL SET! FOR ENTERPRISE: Hollow white outlined flight deck numbers in the correct shape (Tamiya's molded engraved lines depict an incorrectly shaped "65"); "Big E" marking for rear of island; "USS ENTERPRISE CVN-65" titles for the island front in two sizes and three variations for three different eras; Aviation Boatswains' Mates' Wings, ship's plaque, and small black eagle for lower island front; five "Beware of Jet Blast Propellers and Rotors" signs in four styles for different eras; "Hormuz Highway Patrol", kill marks, and related awards for late 1980's period. FOR NIMITZ-CLASS: Correctly shaped hollow and solid numbers for flight decks including one set of oversize solid "68" numerals for an early Nimitz; correctly shaped shadowed and non-shadowed white numbers for islands of all ships in the class; assorted island signs for damage control equipment; twelve different sets of Aviation Boatswains' Mates' wings for all ships' island fronts to represent a variety of eras; and nine sets of "Beware of Jet Blast Propellers And Rotors" warning signs for islands representing all ships and several eras. The heavily illustrated instruction sheet provides detailed information on usage and proper display of all the above markings. SEE GMM 1/350 SCALE USN NUCLEAR POWERED AIRCRAFT CARRIER DECAL SET IN FULL COLOR PHOTOS WITH REVIEWS!